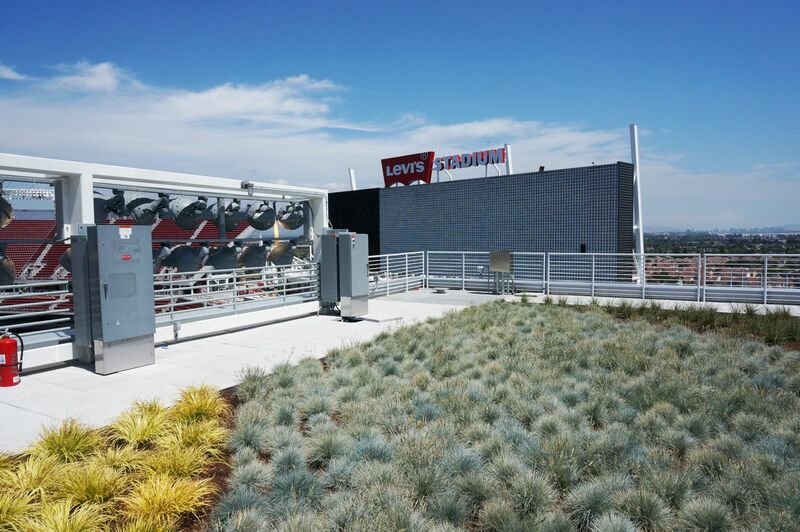 Levi’s(R) Stadium is located at 4900 Marie P. DeBartolo Way, Santa Clara, CA 95054; visit their Sustainability page. 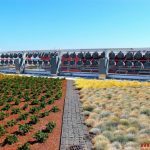 Watch the 2:23 Levi’s Stadium – Project of the Week 10/19/15 video from Greenroofs.com on the greenroofsTV channel on YouTube. 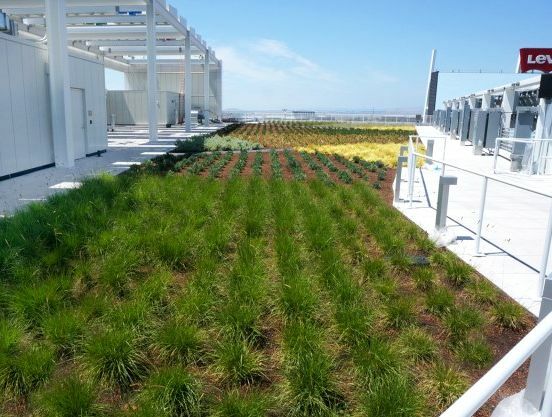 Greenroofs.com Project of the Week video photo credits: All courtesy of American Hydrotech and Levi’s(R) Stadium except for: Levi’s Stadium from air by Runner1928 on Wikipedia, Creative Commons Attribution-Share Alike 3.0 Unported license. 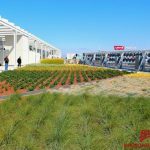 See the Behind the Building and Levi’s(R) Stadium by the Numbers from the 49ers and the project profiles from The Guzzardo Partnership, Inc.; American Hydrotech; and NRG Solar. 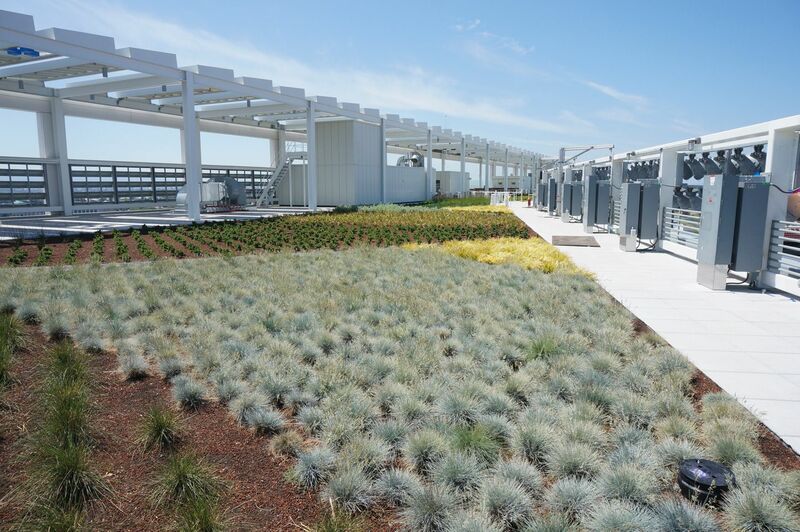 Read the October 8, 2014 Levi’s(R) 49er Stadium Leads the Net-Zero Energy Race by Thad Wharton in the Mosaic Blog; August 11, 2014 Levi’s(R) Stadium has a ‘living roof’ – here’s what it looks like by Steve Berman in Bay Area Sports Guy; May 18, 2014 Some NFL Teams Are Going Green article and 3:25 hard-hat video tour of the near-completed facility by Jim Carleton in the Wall Street Journal; May 16, 2014 San Francisco 49ers Build Levi’s Stadium As Technological, Ecological Marvel by Jeff Fedotin in ThePostGame; and the 49ers Tackle Sustainability With New Green Stadium by Molly Samuel in KQED Science. Levi’s(R) Stadium is a football stadium in Santa Clara, California which serves as the current home of the San Francisco 49ers of the National Football League. 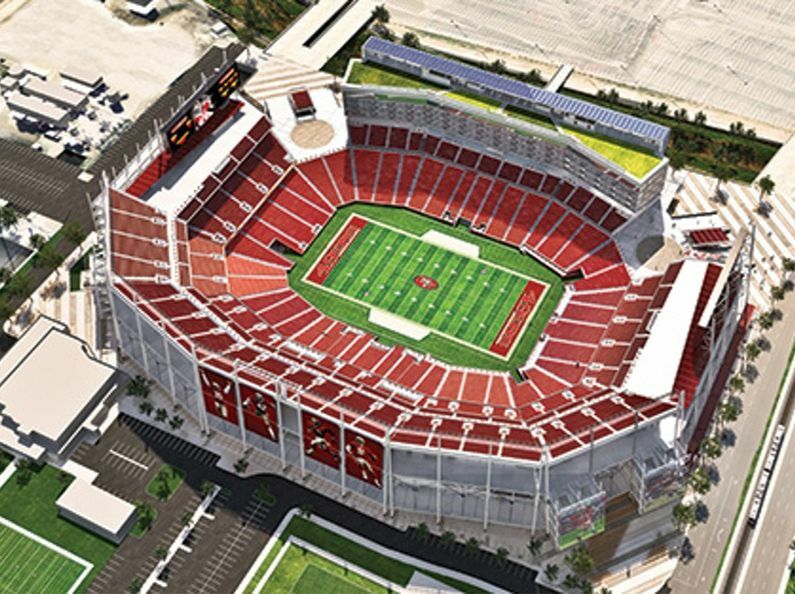 Levi’s Stadium is a multi-purpose facility with the flexibility to host a wide range of events, including domestic and international soccer, college football, motocross, concerts and various civic events, and will be expandable for major events such as Super Bowl 50 in February of 2016. The $1.27 billion venue has 1.85 million square feet, seats approximately 68,500 and features 176 luxury suites and 9,000 club seats. 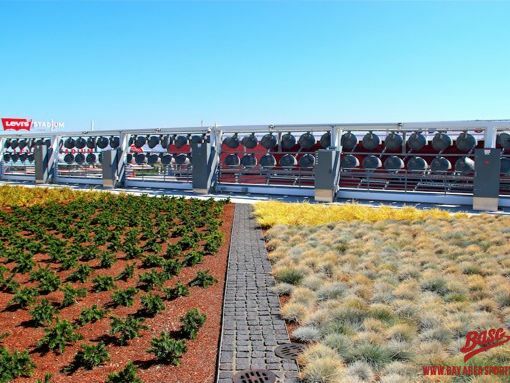 When the gates of Levi’s Stadium opened in August 2014, the stadium was the first United States professional football stadium to have achieved LEED Gold certification. 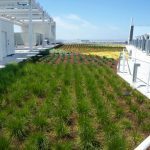 One of the most unique features of the facility is the NRG Solar Terrace green roof atop the 5-story Suite Tower on the west side of the stadium. The three solar bridges, connecting the main parking area to the stadium, include hundreds of solar panels. Visitors and guests may view a live dashboard display featuring current energy measurements, water and air monitors, and other dynamic green features as the building operates daily. The dashboard is located inside Levi’s Stadium in between the 49ers Museum Presented By Sony and 49ers Team Store. 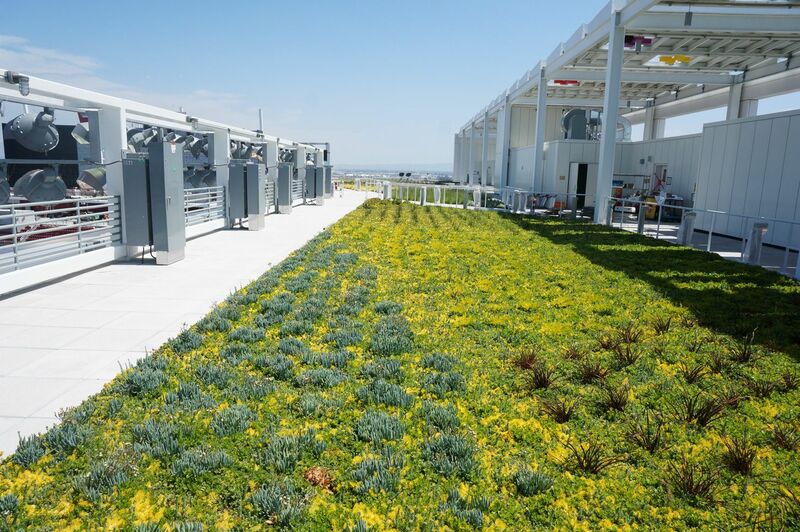 See About Levi’s(R) Stadium and more about its sustainability features. 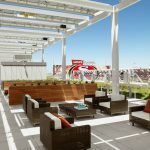 The installation of the 1,186 solar panels on the roof and on pedestrian bridges connecting the parking lot to the park generate 375kW of power at Levi’s Stadium – as much renewable energy as it will consume on game days. 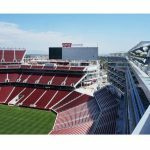 “The iconic feature of the stadium is the massive Suite Tower on the west side, which will be topped by one of the stadium’s most distinctive features. 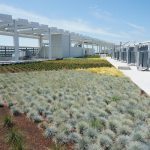 The tower will have a 27,000 square foot ‘green roof’ that will provide building insulation as well as 16 species of vegetation native to the Bay area for the concessionaires, who will utilize same within local farm-to-table menus. 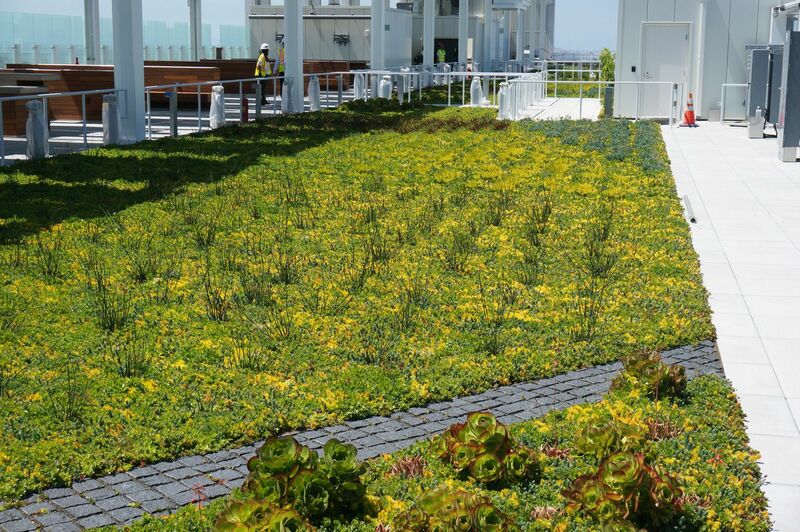 This is also the main location for the solar panels and together comprise the NRG Solar Terrace. 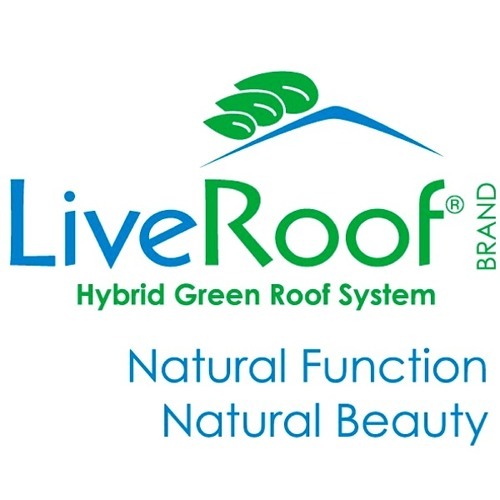 NRG designed the roof installation using a total of 544 SunPower E20 Series panels in a canopy framework,” (Mosaic Blog, 2014). 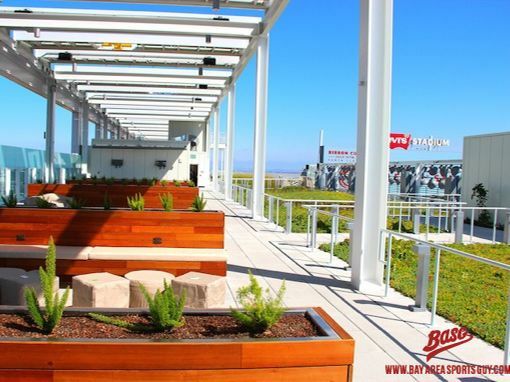 Fans attending San Francisco 49ers home games at the recently completed Levi’s Stadium in Santa Clara, CA, experience football in the most eco-friendly, and sustainable facility in the league. While state of the art technology is used throughout the stadium, the structure itself is kept watertight with various applications of Hydrotech’s Monolithic Membrane 6125. 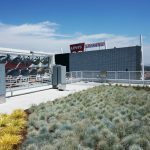 “Just like the pirate ship at Raymond James Stadium or the hole in the roof at the old Texas Stadium, the green roof atop the suite tower will serve as Levi’s Stadium’s distinguishing feature. 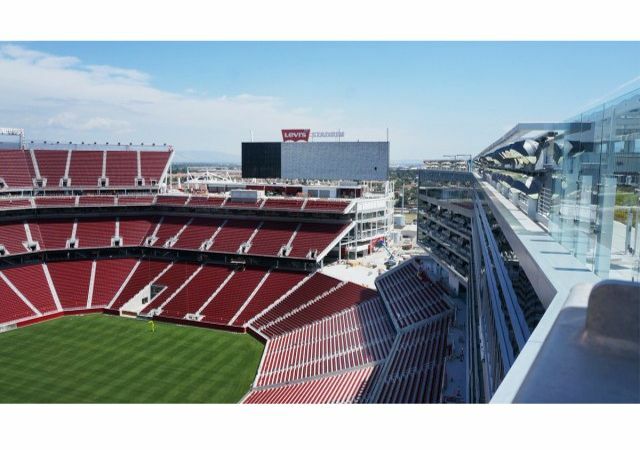 “Every aerial shot will kind of showcase that,” [49ers president Paraag] Marathe said. 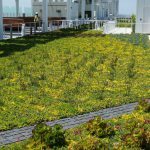 “Inspired by discovery museums, that living roof not only adds aestheticism but also has an ecological function, which provides insulation, limits water run-off and reduces the heat footprint. 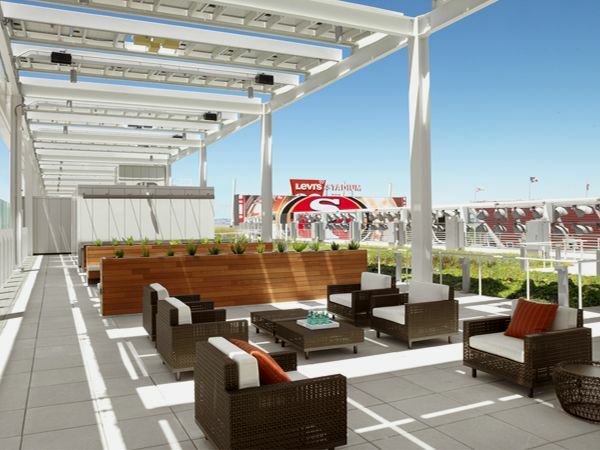 The 49ers also tout the 20,000 square feet of solar panels in and around the stadium. Over the entire year, energy collected from those panels will be slightly greater than what is used during all 10 home contests,” (ThePostGame.com, 2014). 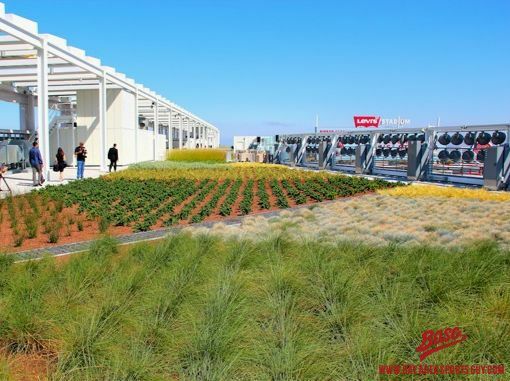 According to the 49ers, reclaimed water is used for both potable and non-potable uses such as the playing field irrigation water. As it is connected with Santa Clara’s recycled water system, 85 percent of the water used at the stadium is recycled. 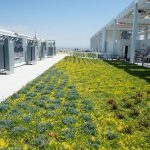 The NRG Solar Terrace Green Roof at Levi’s(R) Stadium features 27,000 square feet of venue space and can be booked for receptions and ceremonies. 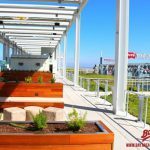 Levi’s Stadium was named 2015 Sports Facility of the Year by Sports Business Journal & 2015 Venue of the Year by the Stadium Business Awards.